The eligibility of players representing Republic of Niger at the FIFA U-17 World Cup India 2017 has been questioned. To qualify for the Africa U-17 Cup of Nations , Republic of Niger beat their neigbours and defending champions Nigeria 3-2 over two legs in August 2016, and the Nigerian Federation had complained the Golden Eaglets lost in 'bizarre circumstances both on and off the field'. 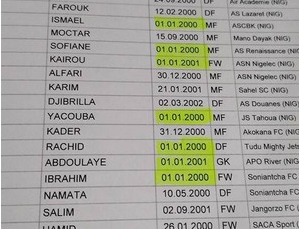 Of the 21 players representing Republic of Niger at the World Cup, seven were born on January 1, five of them were born in 2000 and two more in 2001. If the players who were born in 2000 were born one day earlier, they would have been ineligible for the competition. Luis Verdini told GloboEsporte :''Muslims do not celebrate the anniversary date and therefore do not register the birth. They declare age when they have to take a passport. ''I also worked with adult athletes and they did not know their dates of birth''. Goalkeeper Abdoulaye Boubacar, defender Rachid Soumana, midfielders Ismael Issaka, Yacouba Aboubacar, Habibou Sofiane, strikers Kairou Amoustapha and Ibrahim Boubacar Marou are the players born January 1.